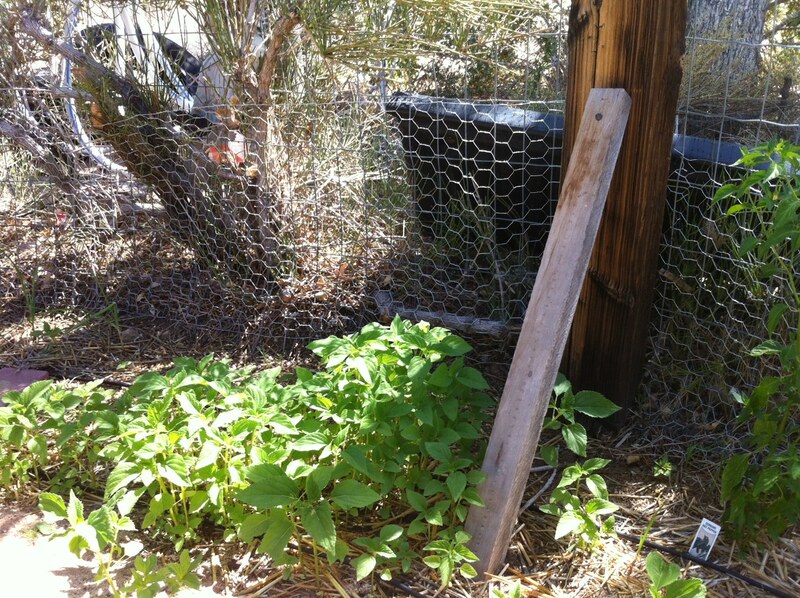 May 18, 2013: Something has been eating my new garden for a while now. It couldn’t be rabbits. I’ve already done rabbit-proofing. That leaves lizards, squirrels, birds, and insects. Neither Reanna or I had ever seen any of those in there, which makes me think nocturnal, but rabbits are the nocturnals on the list, and it’s not rabbits. This barren ground used to have cilantro growing in it. I spent some time today, sitting quietly, watching for the perpetrator. Nothing came by except a hummingbird. I had a nice time. 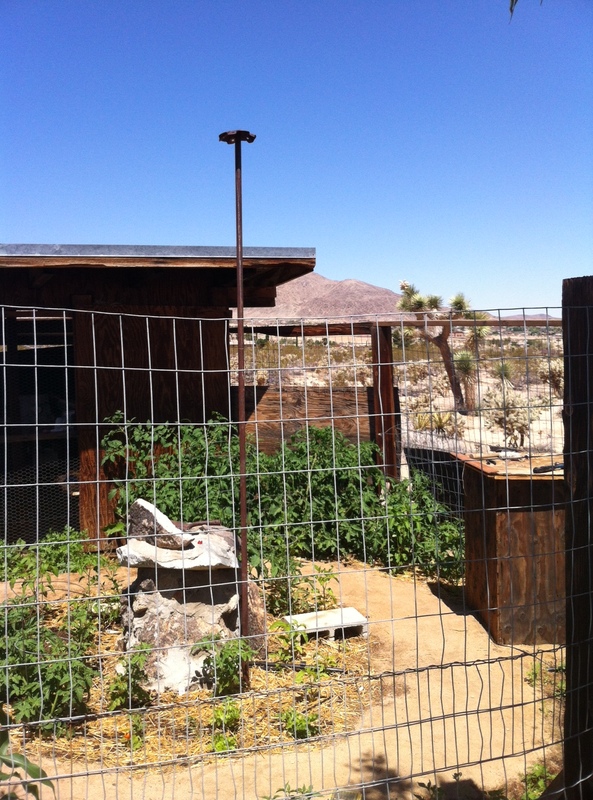 As I sat I remembered the story of the homesteading Keys family, up in what would become the Joshua Tree National Park, staking out their garden with shotguns every day. They grew all of their own food except for sugar and flour. I can drive a few minutes and buy groceries, but they had to go to Beaumont for supplies, two days away. Still, the basic principle is the same. People have been doing this as long as people have been growing food. Maya came by later and said it was probably birds. She’s been gardening around here for years, with great success, so she’s probably right. 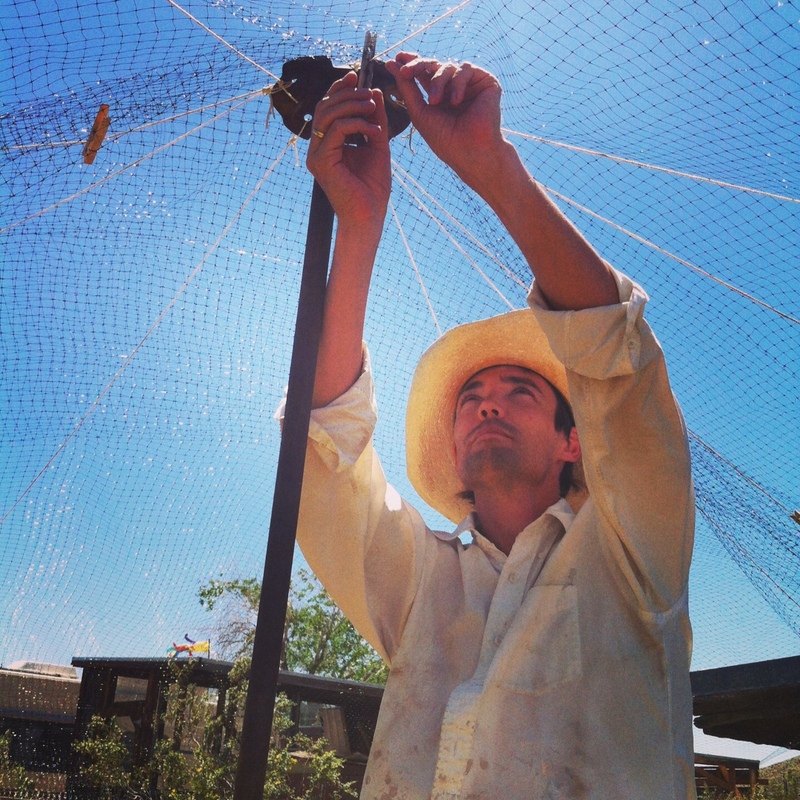 Reanna had already bought some bird netting–technology that could have saved the Keys a lot of time and bullets. I pounded a pole into the ground and mounted an old hub on the top. 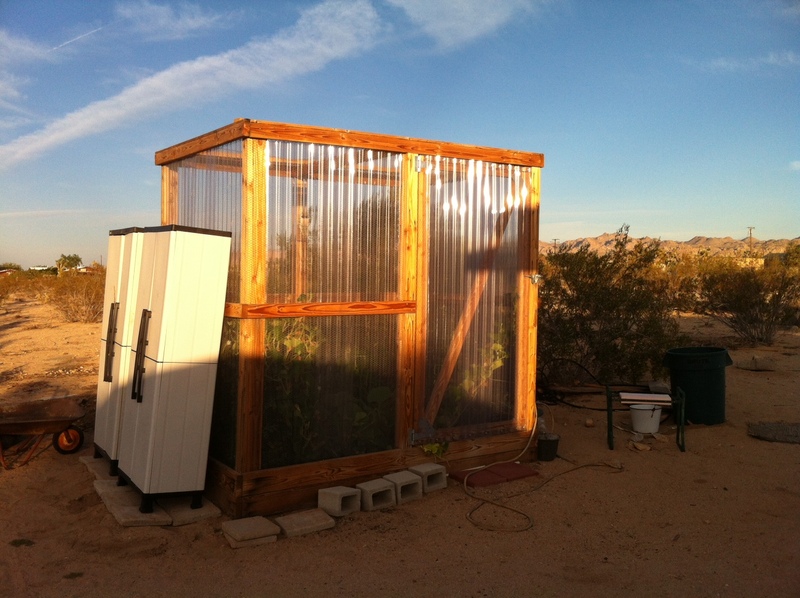 Reanna in completed garden fortress (the plywood and corrugated metal are wind-breaks against our crazy south-west winds. I didn’t particularly want a fortress garden. So many desert gardeners end up with them. I like it, though–I guess it’s my fortress, and that makes the difference. 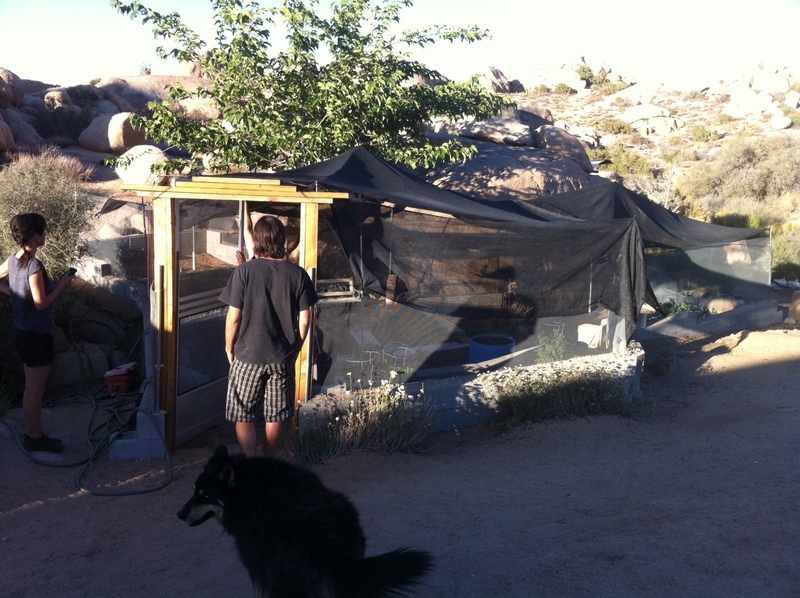 Tee & Eric’s garden fortress: lumber with 1/4″ wire mesh on 5 sides, apricot tree inside. May 24, 2013: Reanna caught a rabbit in the garden today. 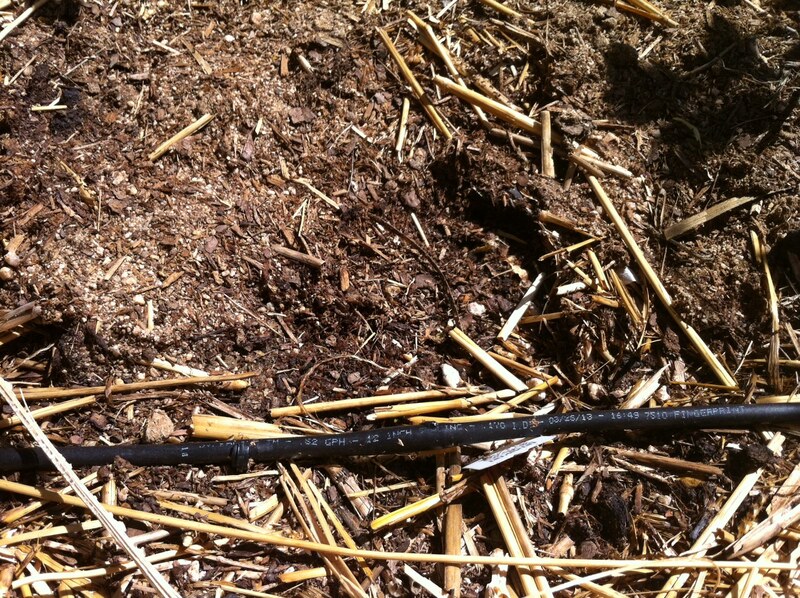 Way back in the rabbit-proofing stage, I’d missed a spot under the ephedra that grows through the fence under the hose bib. Hopefully that does it, because the garden is still getting eaten! 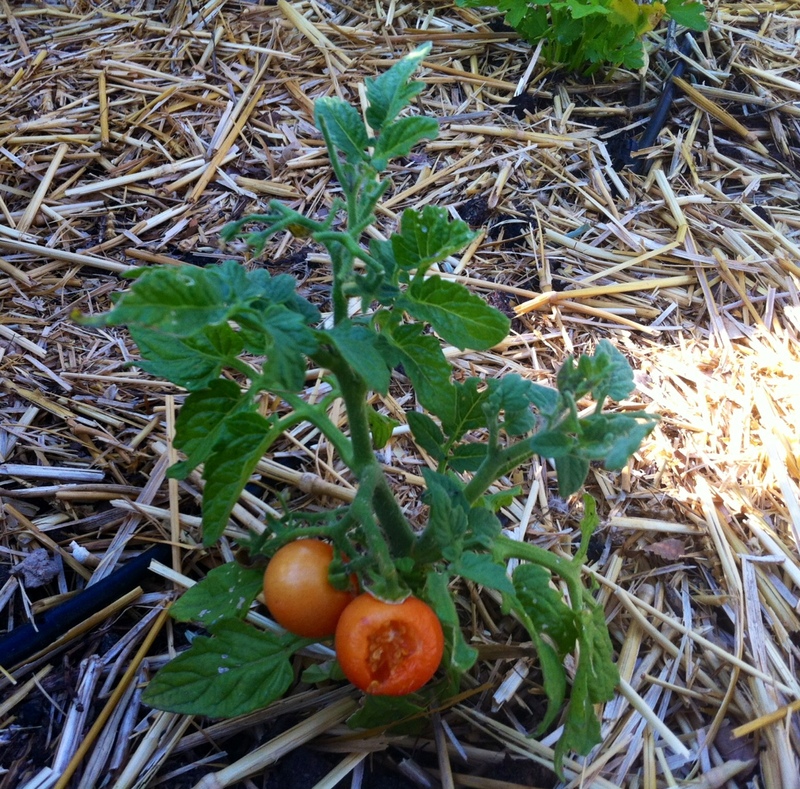 May 27, 2013: The garden continues to be eaten. Today we caught a lizard in there. We didn’t see it eating anything, so no smoking gun. I’ve only ever seen lizards eating bugs around here. 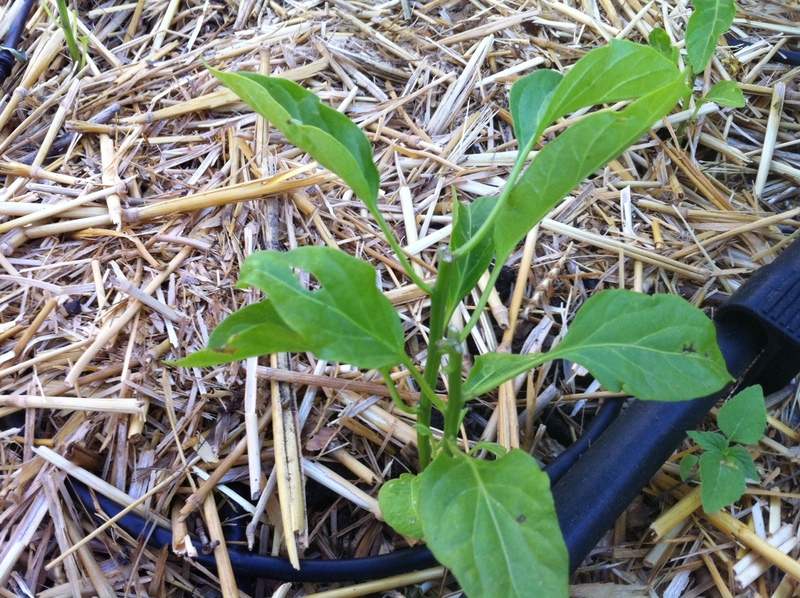 If it’s gotten a taste for pepper plant leaves, we’re in trouble. 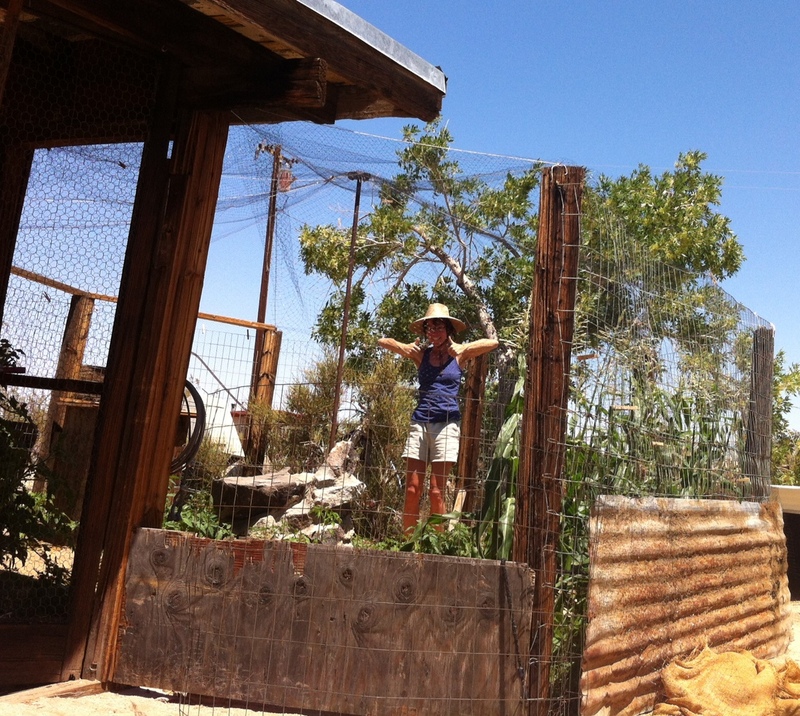 It crawls through chicken wire no problem. 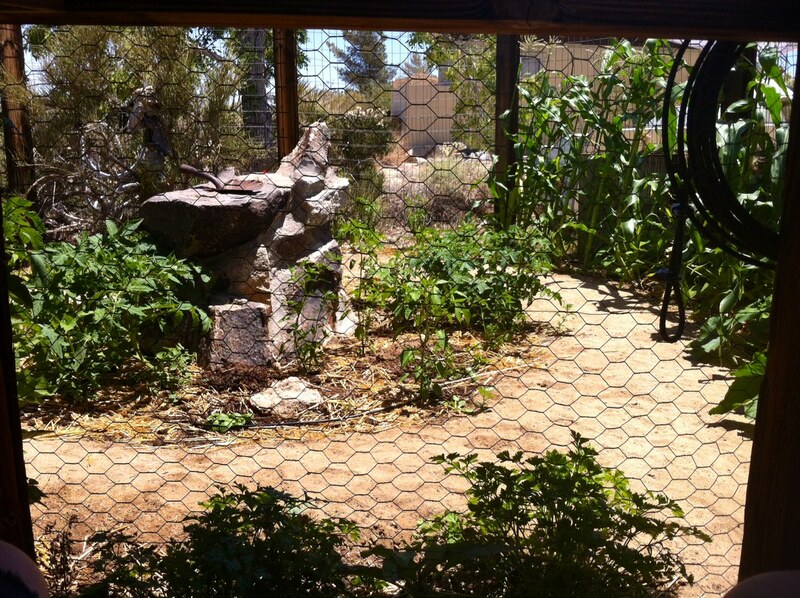 Covering the whole garden in wire mesh would be a big job. 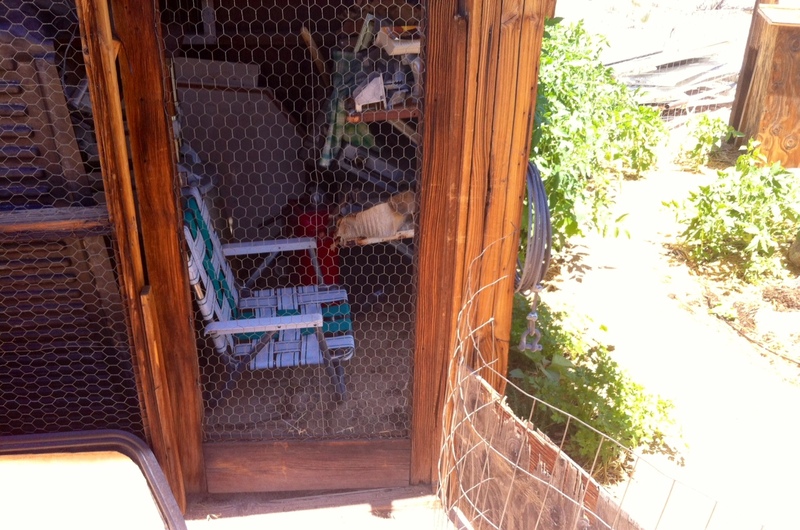 May 28, 2013: Reanna caught another rabbit in the garden and found another crack in the fortress, behind the compost bin, which she shored up. Does that let the lizard off the hook? June 1, 2013: Found another lizard in the garden and stayed still enough that it kept going about its business for a couple minutes. 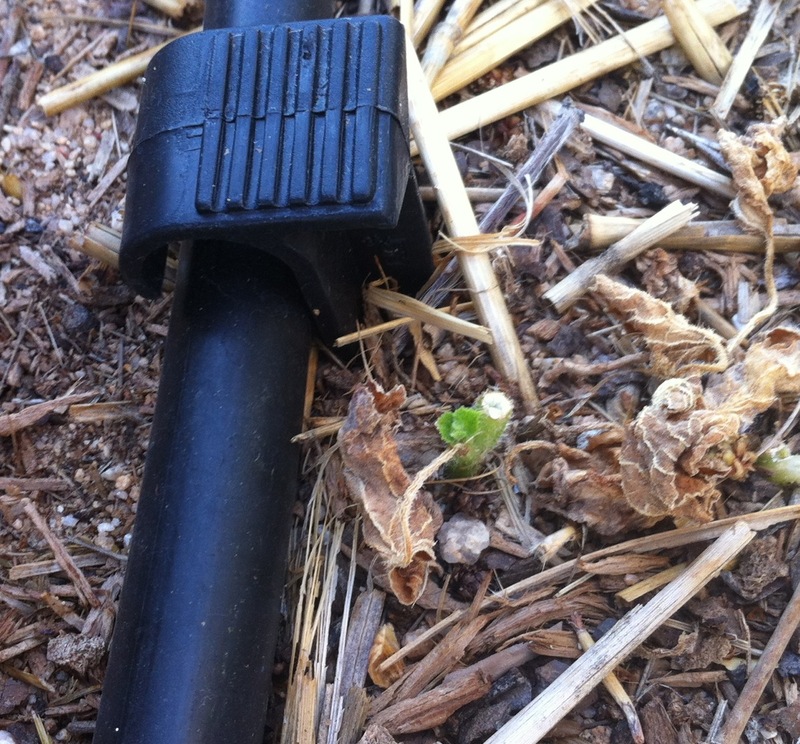 It drank water out of our drip system but I didn’t see it eat anything. Something is still at it, though. The peppers are disappearing, and it’s started eating marigolds, too. This could take a while. 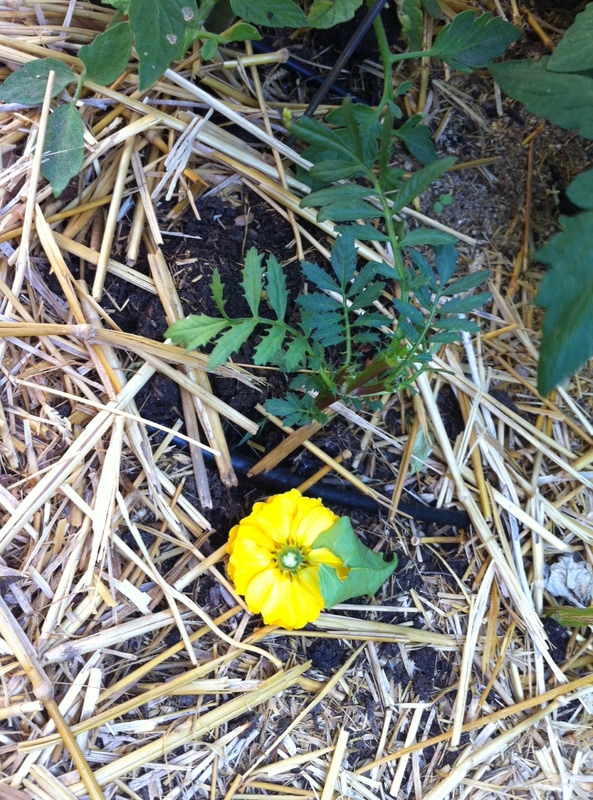 Marigold, stem eaten. The leaf lying partly on the blossom is a partly munched pepper leaf. Oh, the carnage! 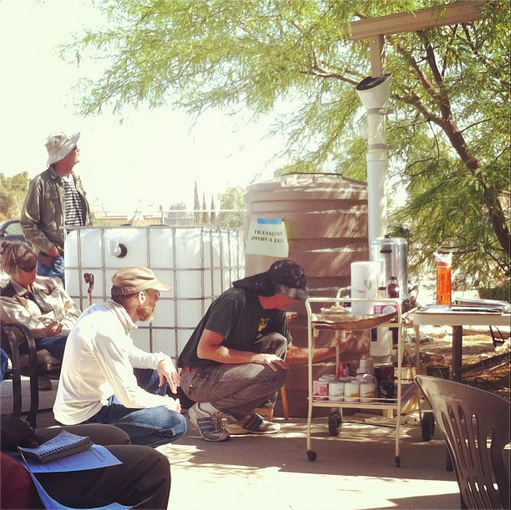 I went to my first Transition Joshua Tree event, a rainharvesting workshop on April 28. It was fun and inspiring to meet with a good-sized group (maybe 20?) 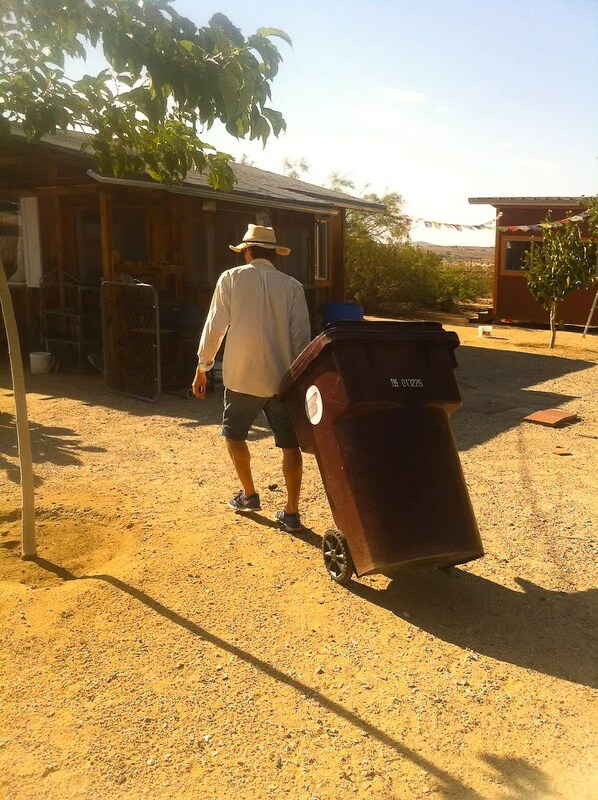 of neighbors interested in water sustainability in Joshua Tree. It was nice timing, too. 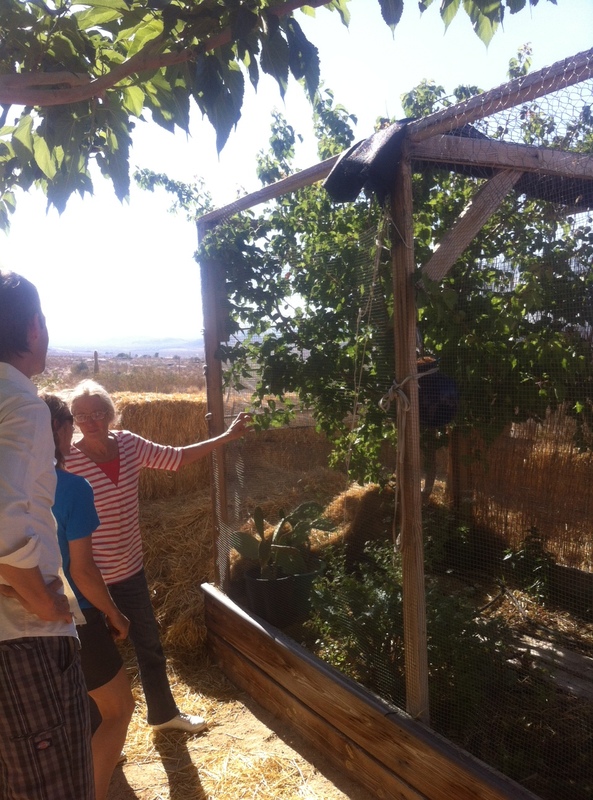 Reanna and I just spent the previous day on the Desert-Wise Landscape Tour, looking at how local people are designing for low-water use. One of the participants reported catching over 2,000 gallons of water in a four-minute “rain event” with one of these systems. While it is very dry here (less than a half inch in 2013 so far, I believe) it can rain really hard. In my 10 years in the rain country of the Pacific northwest, I never saw it rain half as hard as a big rain in Joshua Tree. So you can wait a long time for a rain event but you want a large storage capacity when it does. We want to catch as much of the water as possible because we are using up our aquifer about 10 times as fast as it is replenishing. (If it is replenishing, that is–there seems to be some controversy about it.) Water that runs off of our roofs flows down washes to the dry lake in Sunfair, where it mostly evaporates, and eventually rains on someone else downwind of us. According to the conservation representative from the Joshua Basin Water District in attendance, we use 151 gallons per person per day and sustainable use is under 15. She talked a bit about two plans to replenish our aquifer using technology: One, under way right now, is piping in northern California water from the Hisperia aquaduct down into our aquifer. Another, under study, is diverting the Quail Springs wash from the surface (and the dry lake) underground. I’m not sure what that will look like–I picture a 600 foot hole in the middle of the wash, with caution tape around it–but at least it would be using our own water. Living on less that 15 gallons of water a day looks to be tough. 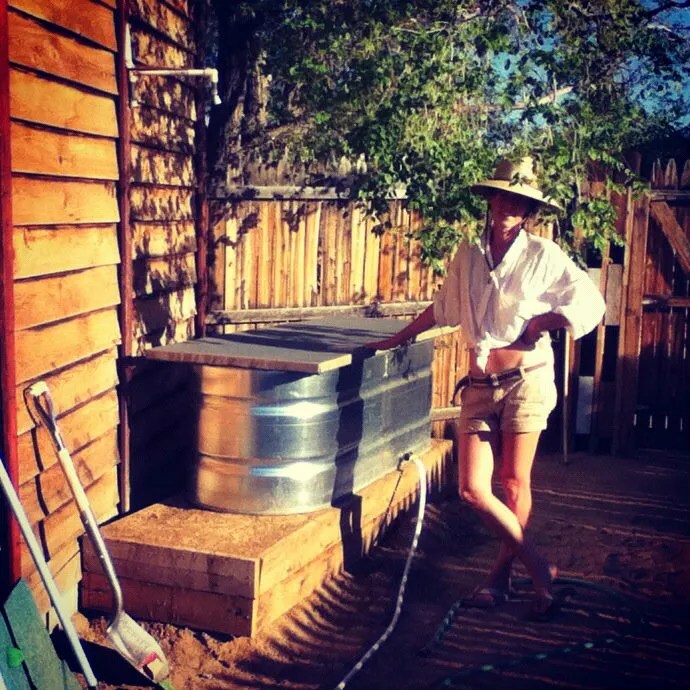 Here’s an essay by my sister-in-law, Maya, about going from 420 gallons per day to 50 gallons a day, with a toddler and while continuing to grow food. I’d like to visit each person who came to the workshop and see what systems result in what level of water usage. Because Reanna and I share a water main with my family, I don’t know how much we are currently using. I will figure it out and write a post about it. Because it is so dry in Joshua Tree, water is great for cooling off. According to my calculus-free, 200-level physics education, this works because a tiny bit of the heat energy stored in our bodies is used up every time a water molecule evaporates. It’s almost like the water molecule uses our body’s heat to achieve escape velocity, to become a gas. 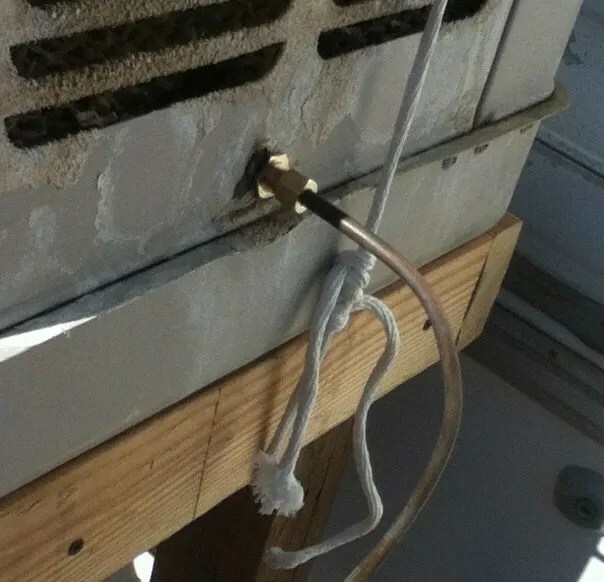 A lot of water evaporating creates a significant cooling. 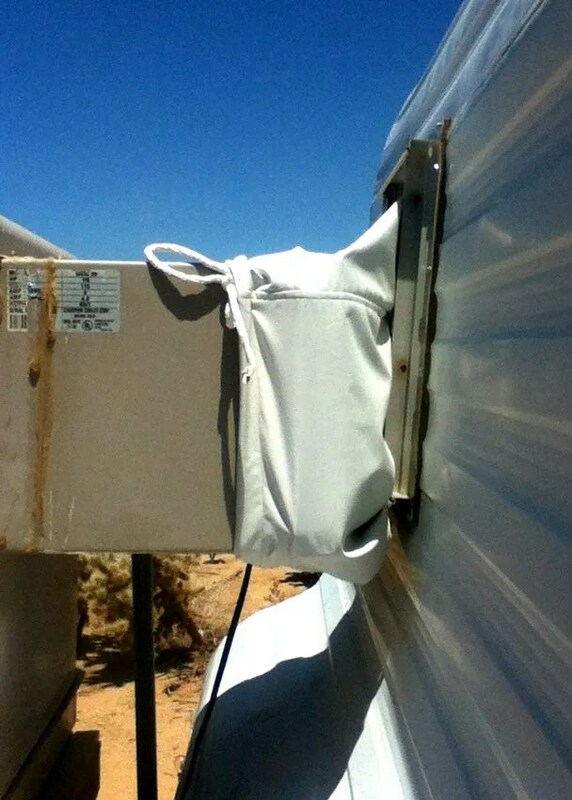 This is how sweating cools us, if we’re lucky enough to be in a dry area. So when it is hot, which is every day in the summer, we get wet a lot. Inside, we have spray bottles handy so we can spray each other whenever someone starts complaining about the heat. 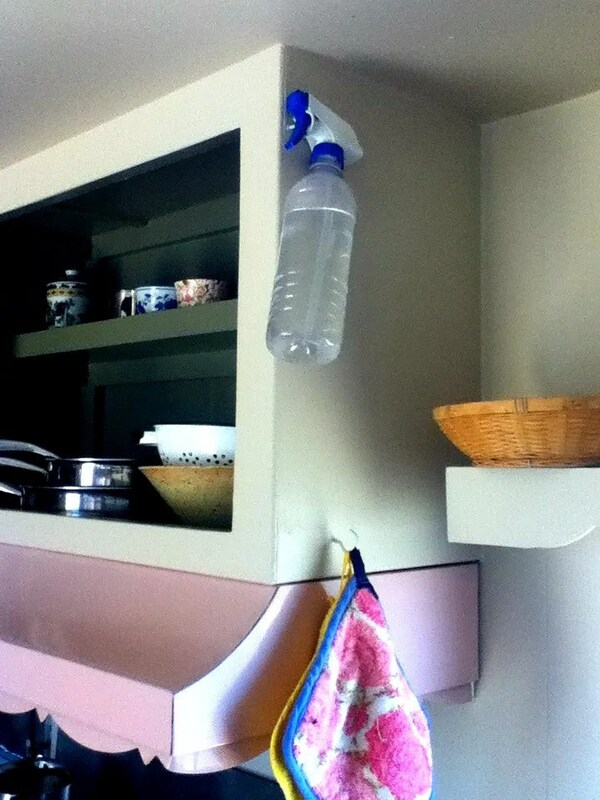 Above the stove is the handiest place for the spray bottle. Outside, we often hose each other off. A good drenching keeps us cool even on the hottest days, until we are dry. 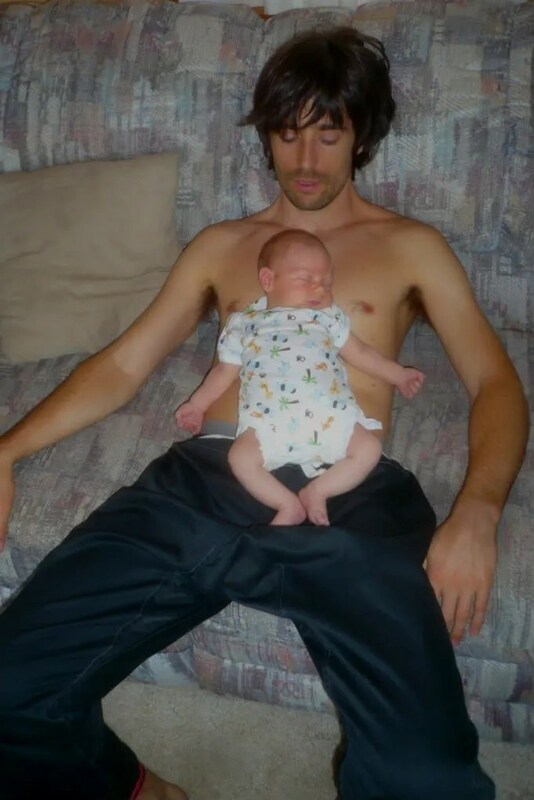 Granted, that might only be for 15-20 minutes on a really hot day, but comfort is worth taking breaks that often. The water stays cool even on the hottest days, also because of evaporation, so it is always refreshing to take a dunk. I built the little platform so when we drain the tank, we can water our plants. 12-inch dirt-filled stock-tank platform with screen lid and hose outlet. This photo was taken before I put plank decking on each side of the platform so we don’t get our feet dirty getting in and out. 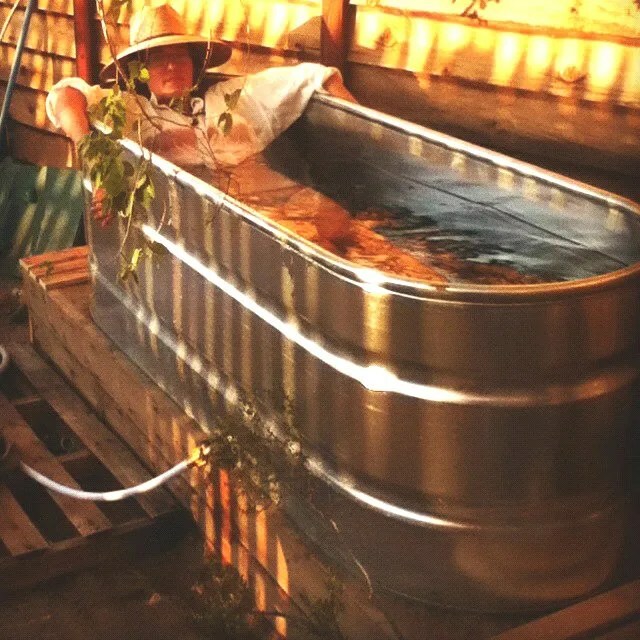 We also got a “swamp cooler” from our friends Mike and Sarah. 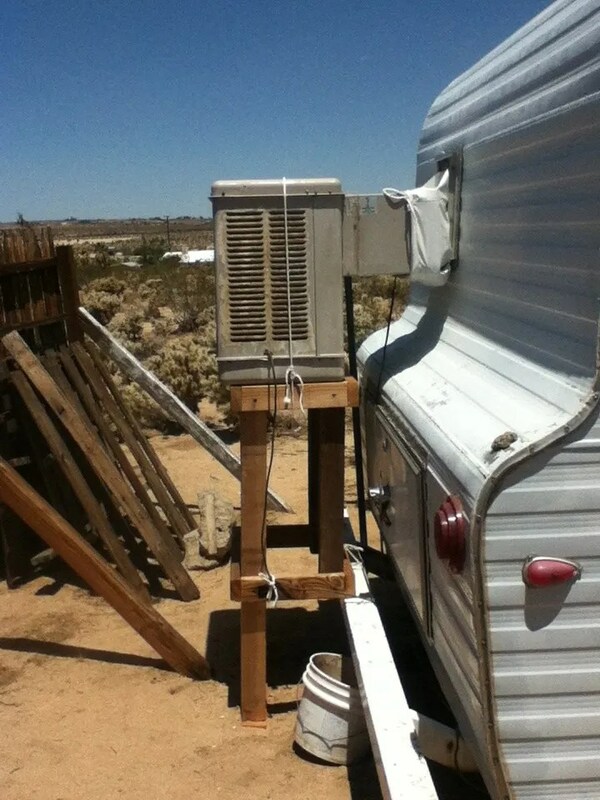 It wasn’t big enough to cool their house, but it’s good for our trailer. 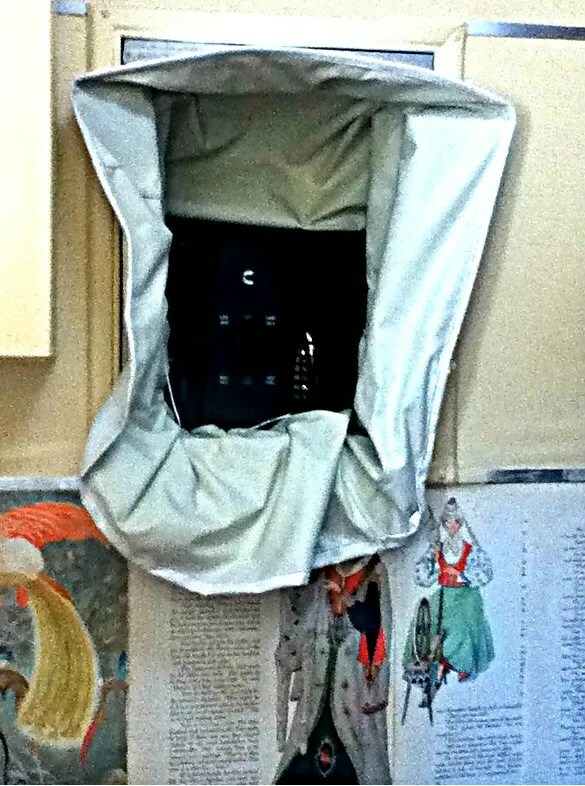 Reanna sewed a sleeve to funnel the air into our back window, so we didn’t have to cut a big hole in the wall. It makes a huge difference. 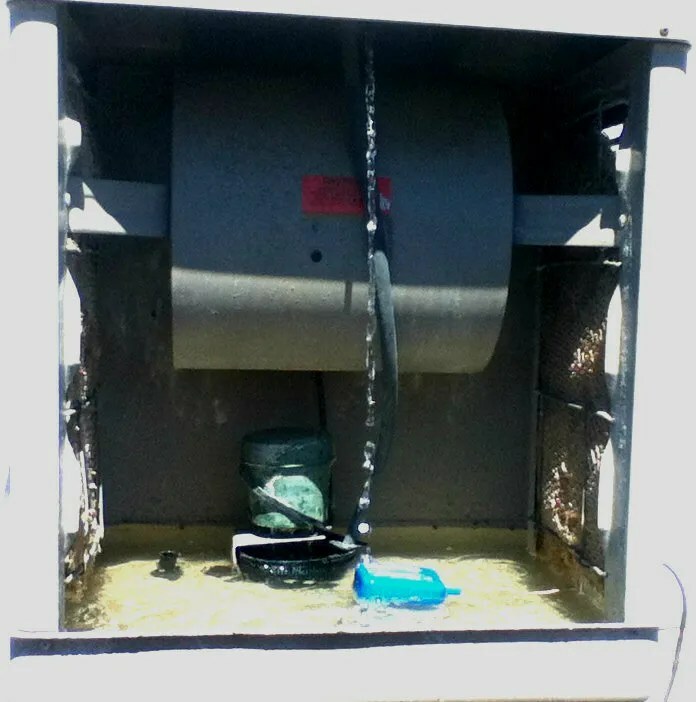 A swamp cooler is simple and effective: A pump pulls hot, dry air from outside through wet sponges, creating cool, moist air inside. The physics involved is similar to sweat-cooling, except the heat energy used to turn the water into a gas is drawn from the air itself. 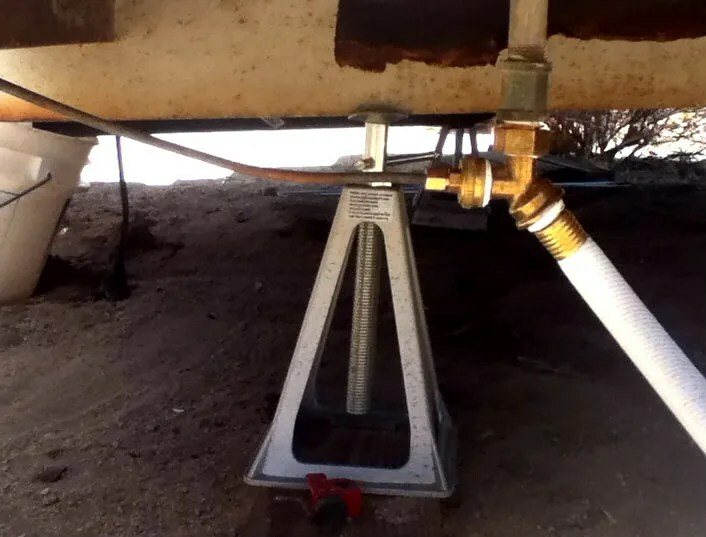 A splitter where our (lead free) hose feeds the trailer, fitted with a compression joint to attach copper tubing. You can kind of see the copper-tube cutter (red) at the bottom of the frame. Another compression joint, feeding the float valve that lets water in when the level gets low. Swamper, inside: The float valve (blue) lets water in. The water pump (green) pulls it up and pours it down the three sponges in the left, right and back (removed) walls. The fan (drum at top) pulls the air in through the sponges and pushes it into the trailer. Simple! The most fun way to use water to cool off, of course, is swimming. 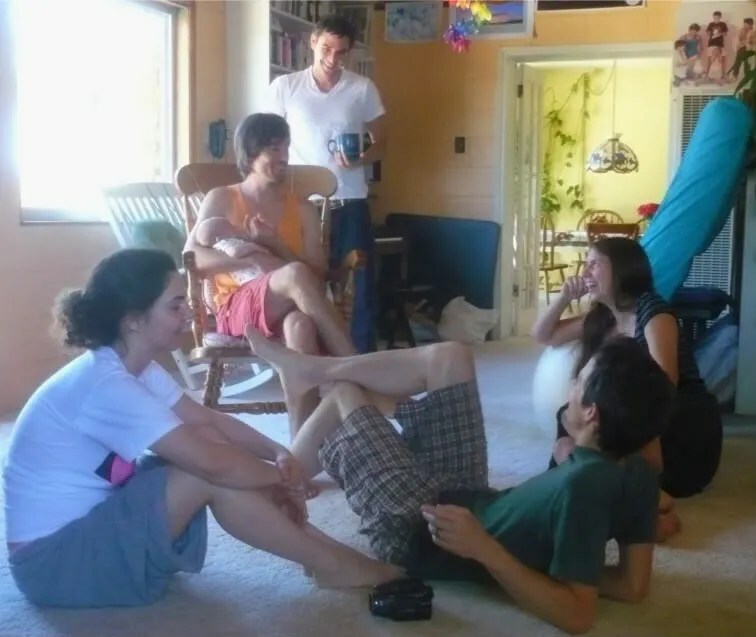 My mom got Reanna and me a month’s pass to the pool at the Joshua Tree Retreat Center (AKA Mentalphysics) as a wedding present, and we used that quite a bit. It was awesome. Thanks, Mom! Reanna at the JT Retreat Center. Note luxuriously empty pool. Reanna & Rob at the Joshua Tree Inn’s Hacienda Pines pool. 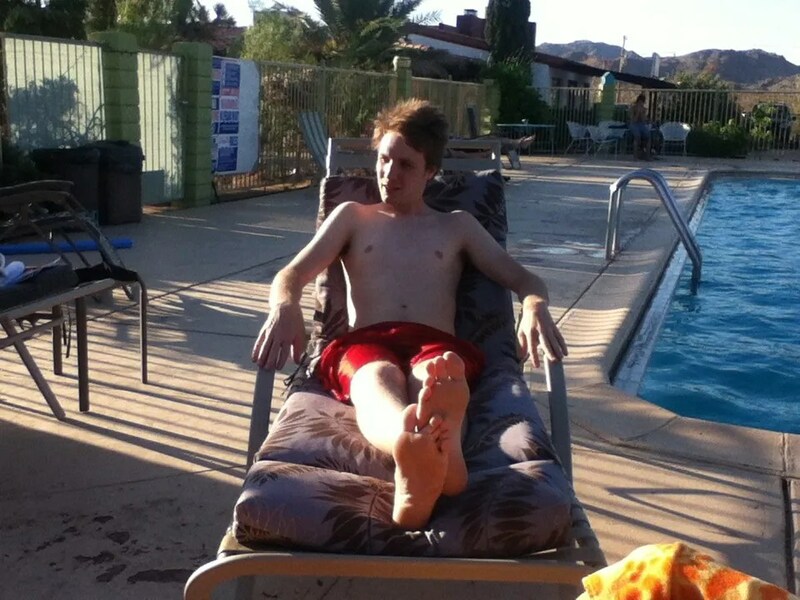 Matt at JT Inn pool. 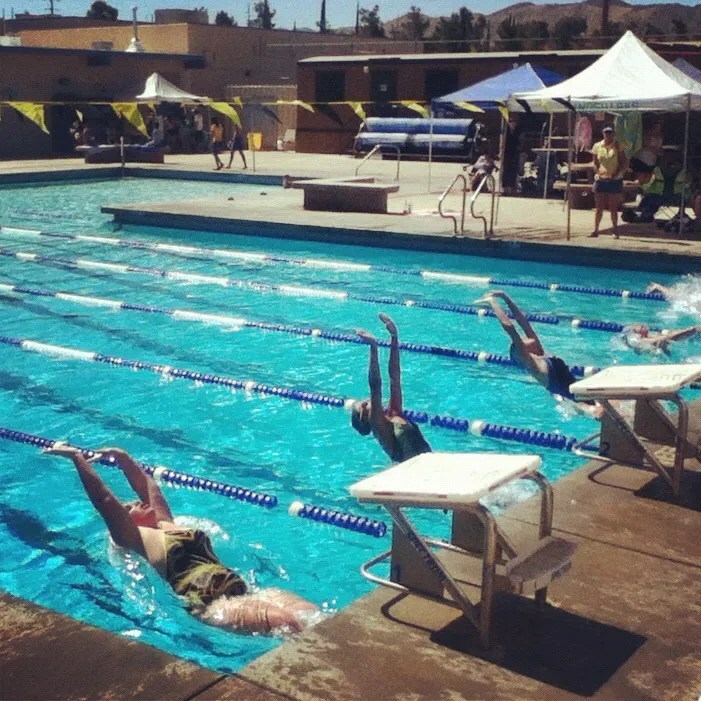 Backstroke race at the Yucca Valley High School pool, also open to the public in the summer. 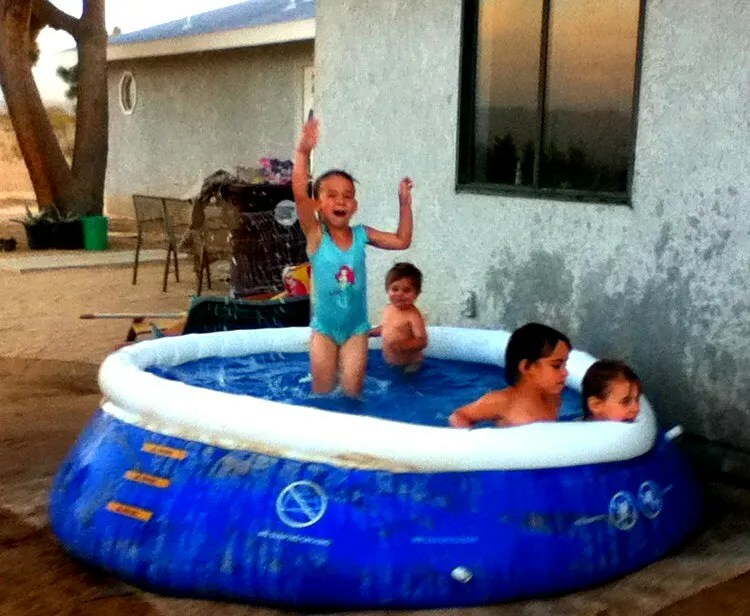 Kids in Ken & Katie’s blowup pool. 90s: Hot. The sun is hot. 100s: Baking Wall of Heat. The sun is hot, but the air is also hot. One option for dealing with this is not dealing with it: Stay inside with the swamp cooler on. If I spend most of the day in the office, my moments spent outside feel refreshing, a warm-up. 1) Straw hat with a wide brim, loose enough for ventilation, but not loose enough to blow off in a breeze. I think the sun is good for us, but getting sunburned is not. I get sun on my skin every day but avoid burning. The hat helps with that. 2) Polarized sunglasses. I also think unfiltered sunlight is good for our eyes, and I get a fair amount every day, but hours in this kind of intense light makes me feel like I’ve sunburned my retinas. 3) My best white dress shirt. 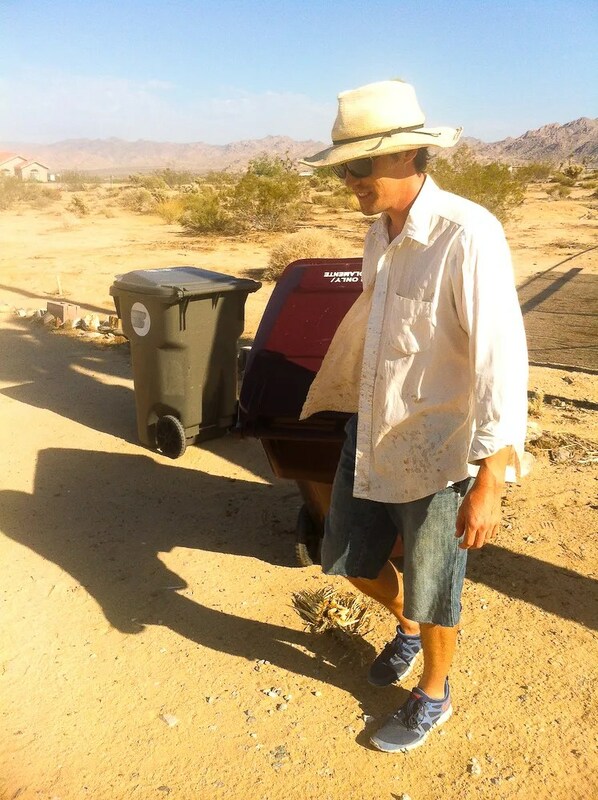 My wife Reanna was appalled at this sacrifice, but this is how I justify it: a) I do way more yard-work than I do dressing up, so it gets more use. b) It fits really well, so it’s comfortable, doesn’t restrict my motion, and doesn’t get tangled in the saw or drill or plant-to-be-pruned. c) It’s bright white, so reflects the sun really well. d) It has long sleeves, so I don’t have to wear sunscreen on my arms, but I can roll them up when appropriate. e) It has a collar which I can turn up to protect my neck. When the sun is low, my hat doesn’t do the trick for my neck. Again, less sunscreen. f) It buttons up, so I can button or unbutton, as needed, for venting. Most often I have only the second-to-top button fastened for maximum venting plus protecting the skin of my upper chest, which received more than its share of sun damage in my youth. g) Once it has some paint and a few tears, neither of us will feel remotely precious about it. 4) White work gloves. Sometimes gloves are not appropriate to the work I’m doing, but when they are, I wear white cloth gloves with rubberized palms and fingers. They save sunscreen and save my delicate musician hands from injury. 4) Shorts to the knee. Protects my thighs from sun while allowing leg-venting. This does leave my calves vulnerable to sun. In the middle of the day they get somewhat shaded by my body. At other times I can often find a shadow to fall on them. If not, sunscreen or sunburn. I find the trade-off worthwhile. 5) White socks. This is the part I’m most conflicted about. I generally eschew socks when I can get away with it, but in this kind of heat my feet can sweat and get stinky and uncomfortable. Plus, socks help make having sand in your shoes less uncomfortable. And they protect your ankles from sunburn. 6) Light, vented shoes. I wear Nike Free 3s, the most comfortable shoe yet created. They do not protect feet from dropped tools or lumber but, cross my fingers, so far it’s worth it. 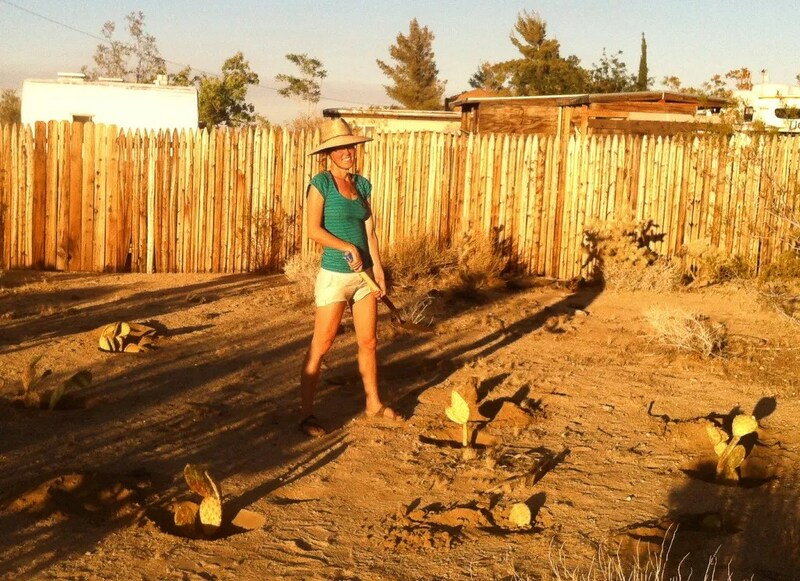 Reanna and I picked up a truckload of prickly pear pads of several kinds from our friends, Elise and Wolf. They are not a kind of prickly pear that is native to this part of the desert, but they grow well here. They said to plant them with the bottom pad about half underground and to water them for the first month. After that, they shouldn’t need water. And we can look forward to them growing quickly and producing yellow and salmon flowers, plus edible fruits. The rounder ones grow up a couple feet but stay close to the ground. The longer ones (like just to the right of Reanna) grow taller, six feet or so. Reanna is from the Pacific northwest and I grew up in Joshua Tree, CA, where we are currently living. We have an ongoing conversation about humidity here because having grown up in a wet climate, she is vigilant for the ways that moisture in the air decomposes things. “If we don’t keep it warm in here, won’t condensation damage the books?” No, it won’t, and probably wouldn’t even if we had a constantly boiling pot of water. The only place I’ve ever seen mildew in Joshua Tree is in one of our bathrooms which, until very recently, had no windows and no fan. This was not aggressive mildew either, just noticeable every once in a while. 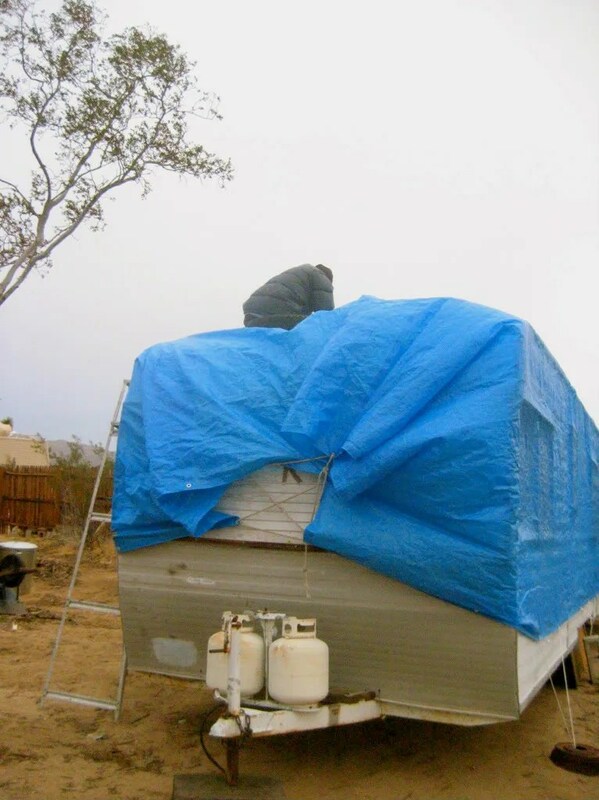 “If the roof of the trailer has leaks, won’t there be tons of mold in the walls?” No, not likely, because even if rain was pouring right through the trailer, it would be completely dry again within hours. I have never tracked humidity levels before, so while I knew that Joshua Tree was dry, I didn’t know what level of humidity qualified as dry. I also didn’t fully understand the different measurements of humidity that are floating around out there. The short version of that story is that there are three units of humidity: absolute, specific, and relative humidity. Absolute humidity is grams of water per kilogram of moist air and specific humidity is kilograms of dry air. Relative humidity is more complicated. If I understand correctly (if incompletely) it is the ratio between 1) the pressure that the water vapor in a given amount of air would exert on the insides of a container, should it somehow be trapped there without its accompanying dry air, and 2) the pressure below which water would start condensing out of the air. Relative humidity is the measure of humidity that you usually see in weather reports, partly because it takes into account temperature–at lower temperatures, air holds less water. 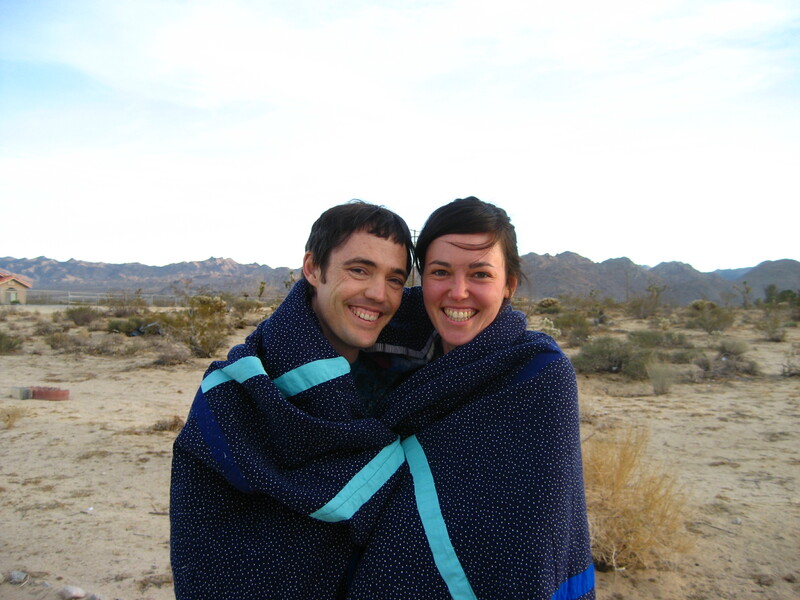 Reanna and I moved from Eugene to Joshua Tree in early November. 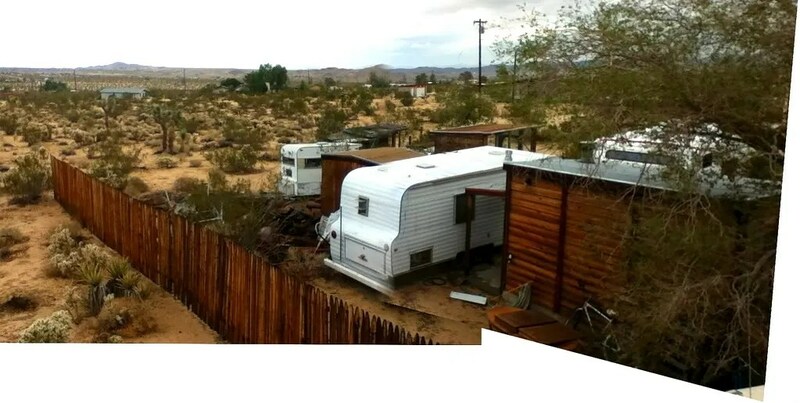 We were there about a month before leaving to visit her family, and our primary project was starting to set up a new living space: an early-1960s Kenskill travel trailer. We will see how this arrangement suits our needs in real life, but the idea of living in a trailer suits the idea of our needs quite well for the time being. I have lived in trailers off and on throughout my life, and while I found nothing glamorous about it, I really appreciate how cheap and mobile they are. Cheap is very appealing now, with large student loans to pay off. Reanna has been interested in the tiny home movement and travel-trailer renovation for years (check out Tumbleweed Tiny Homes, Tiny House Blog, and a couple of trailers), so her vision is the engine for this project. Before, Looking Northwest: From left to right you see the sauna/bath house, our trailer in its old spot, Uncle Bill’s shed (to be moved), Grandpa Bob’s workshop (to be made into sewing palace), and the old goat pen. Before, Looking Northeast: In between the fence and the structures, you can see a pile of 2,500 pounds of plywood and other stuff, the remains of an 8′ vert ramp. Then left to right, an 8′ trailer, Uncle Bill’s shed, our 24′ trailer, and the sauna/bath house. During, Looking Southwest: Behind me you can see the 8′ travel trailer that served as my bedroom in high school. We gave it away to a local a few days later. It actually made me quite sad to watch it limp away. During, Looking North: The pile of plywood on the right was the last third or so of the landfill. After, Looking Northwest: The plywood is gone, 24′ trailer in its new place. 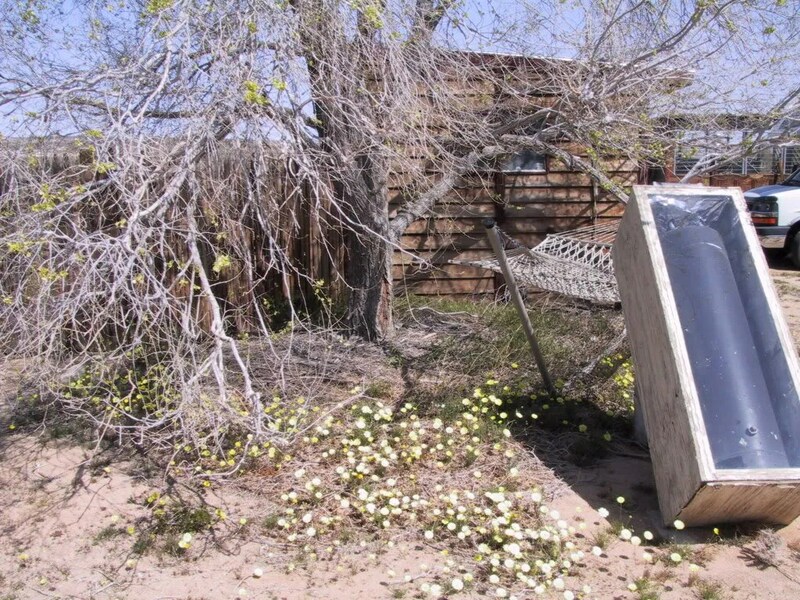 You can see we’ll have a nice little yard in between the trailer and the bath house, once we move Uncle Bill’s shed. After, Looking North: Here’s the best shot of the trailer. My friend John lived in it while he did his undergrad. 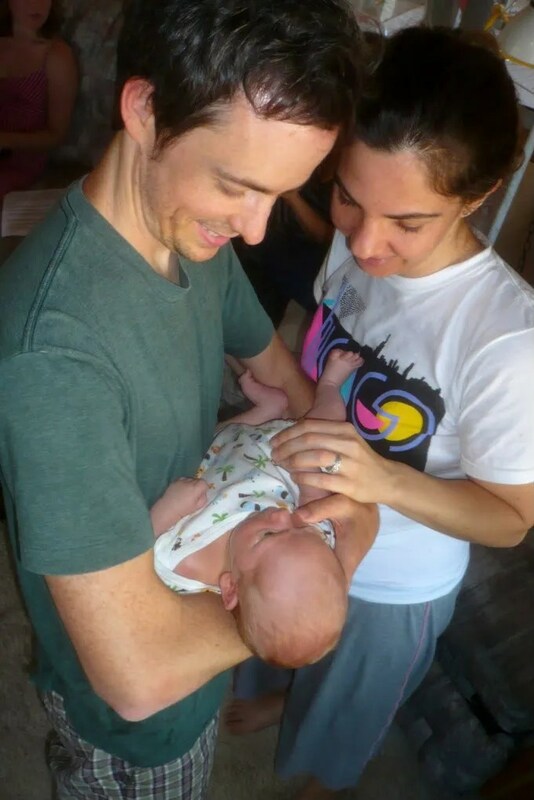 It had been his grandparents’ and parents’. He gave it to me in the late 90s, when I lived in it for two years. It’s got an unusually nice layout, with big windows on the kitchen/dining room side (the right), bedroom in the middle, and bathroom in the back. Still to do: seal it up to prevent further water damage, prep for paint, paint, put in new flooring, fix plumbing, furnish, move in. I love how hot it is in Joshua Tree. I love the feeling of the heat on my skin when I go outside. I love how palpable the sunlight is. 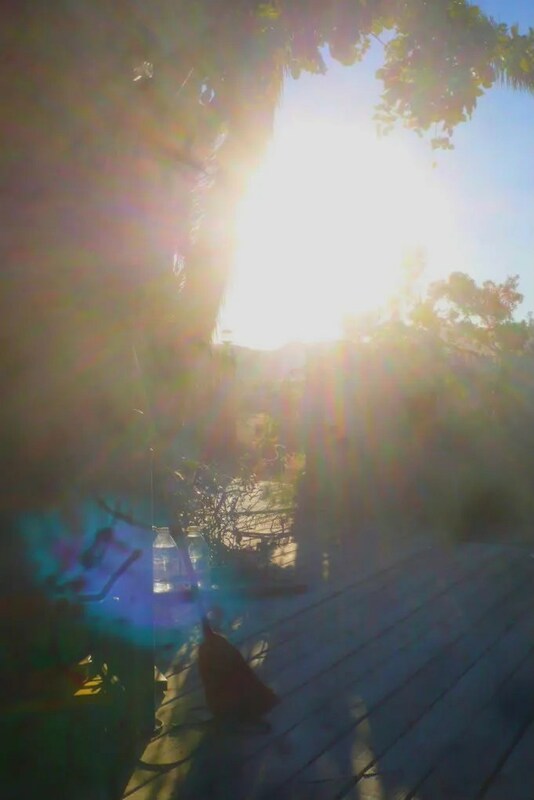 In Oregon, sunlight is mostly just something to see by. In Joshua Tree, it penetrates you. You breathe it in. It fills up a vital part of your psyche. I love how quiet it is at night, and dark. I love how it is just slightly cool and perfect for looking at the stars and the Milky Way, which are clear and brilliant. 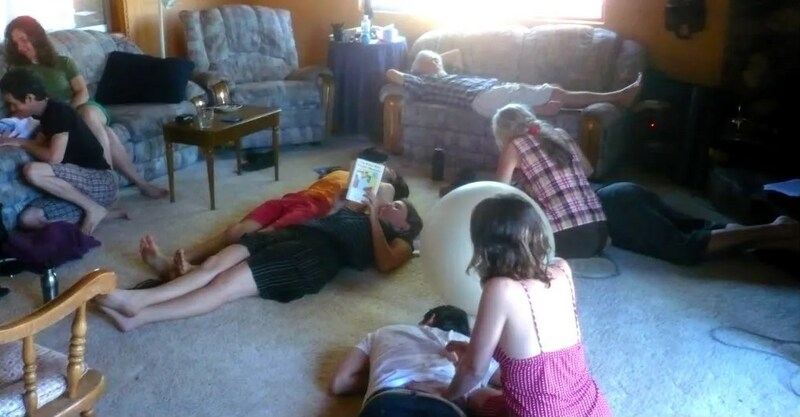 Today, I loved lazing around in the living room with almost my entire family, talking about food and posture and babies, and listening to the Brandenburg Concertos. And after that, I loved lying in the hammock, drinking a mango lassi, listening to the warm, dry wind move through the elm leaves above me, watching the sky turn colors as the sun set. I went to Joshua Tree for spring break. It was great to see my parents and most of my brothers. Today was the first day of astonishingly pleasant weather of the year in Eugene, and it reminded me of how astonishingly pleasant it is in Joshua Tree almost every day this time of year. 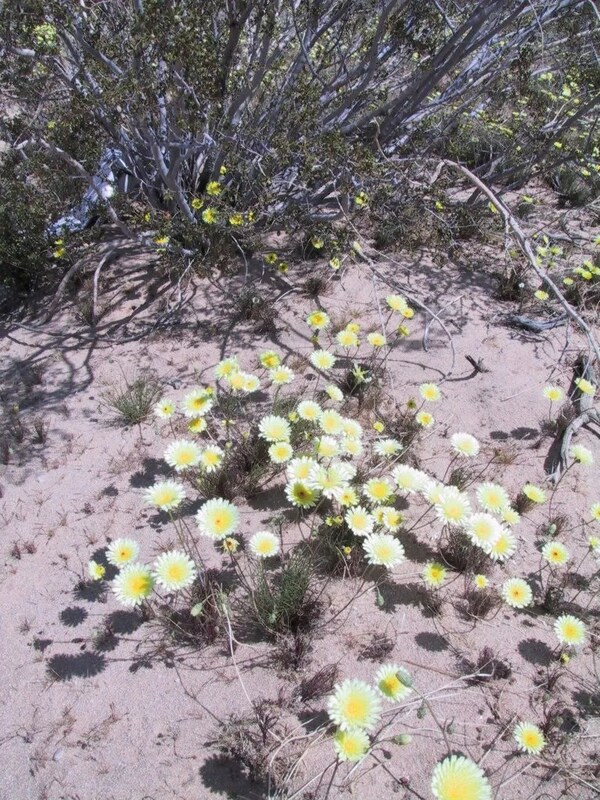 The first wave of spring wildflowers are carpeting the open desert–yellow ones called desert dandelion. Unfortunately my camera is broken and these photos are a bit blown out, but they are better than nothing. In the first one you can see that the elm is budding. The building is our sauna. 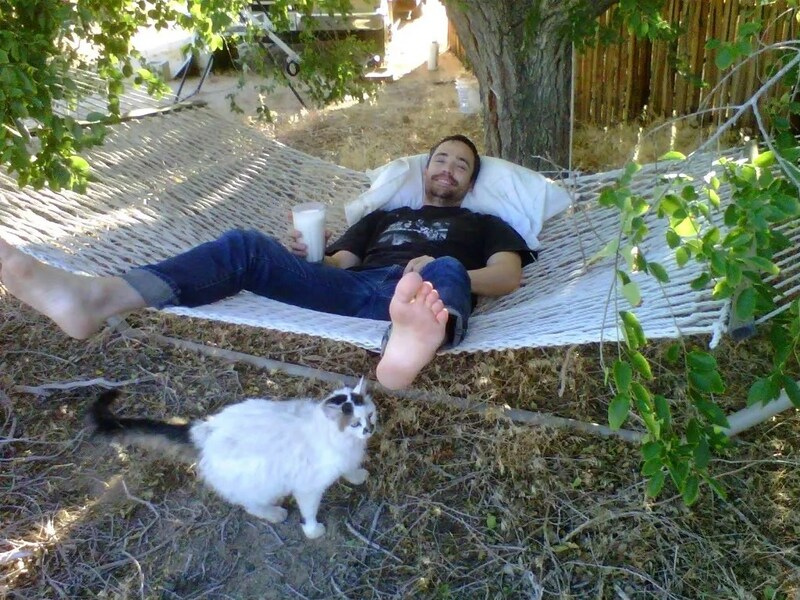 The hammock is one of my favorite spots to chill. 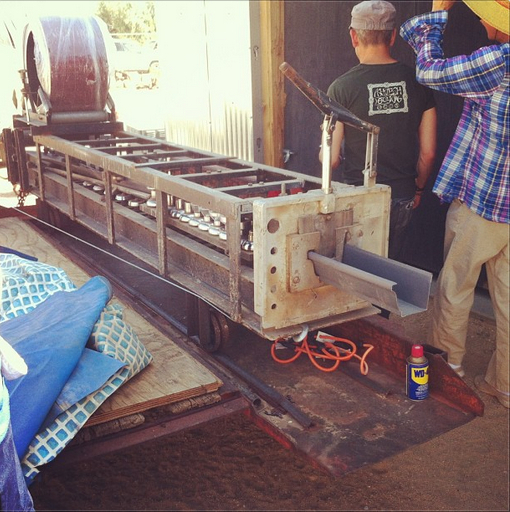 The object in the foreground is a solar water heater. In the back on the right is Grandpa Bob’s workshop and my dad’s venerable motor home, Inertia. Ouch. The color is off. Imagine the sand much less pink and the flowers more yellow. The bush is a creosote, which have 70 foot taproots, and one of which is 11,700 years old, out near Lucerne Valley.